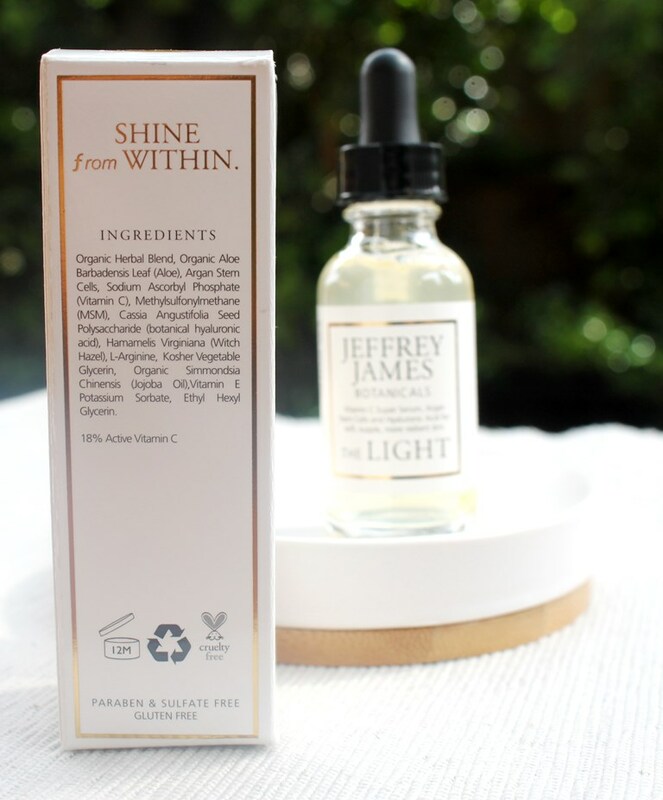 The Jeffrey James Botanicals The Light claims to accelerate the skin’s natural repair process and fight ageing for a fresh and radiant appearance. Represented at the highest concentration is an ingredient called Organic Herbal Blend. It is not surprising that the EWG database raises a flag against it since the nature of the blend is not declared. After all, some herbs shouldn’t go near your face. The unknown factor makes it impossible to decipher. Update: After contacting Jeffery James Botanicals, the herbal blend was disclosed and is discussed in detail in the review of The Mask. So moving on to the ones we can assess, the hero ingredient, Vitamin C, is represented by a stable derivative, Sodium Ascorbyl Phosphate and present at 18%. It is considered gentle and stable and converts into Ascorbic Acid after absorption. As a powerful antioxidant and anti-ageing ingredient, it is helpful for treating acne, protecting the skin against oxidative stress, promoting skin development through collagen stimulation and tone brightening. It is able to assist in the prevention of hyperpigmentation and senile keratosis. Aloe Vera and Argan Stem Cells are included at even higher concentrations given they precede Vitamin C in the ingredient list. Aloe Vera can soothe skin and serves as an anti-inflammatory as well as acting to moisturise skin. Argan Stem Cells are known for their regenerative properties, working to strengthen skin’s elasticity. They penetrate the skin deeply to effectively repair damage and fight ageing. MSM is sometimes referred to as “nature’s beauty mineral” due to its ability to enhance collagen bundles and restore the foundation for healthy skin. It is a pure organic sulfur found in all plants and tissues. Cassia Angustifolia Seed Polysaccharide is a water-binding sugar native to India. It is represented at a concentration of 12%. With a similar structure to Hyaluronic Acid (HA), it helps hydrate by binding up to 1000 times its weight in water and by creating a barrier on the skin to lock in moisture. Due to astringent properties, Witch Hazel is a good acne fighter, helping to manage oily skin and excess sebum production. It is also a good repairer, speeding up the healing process. L-Arginine is an essential amino acid which acts as an antioxidant and also helps to build collagen production while Jojoba Oil is actually composed of 97% wax esters and mimics human sebum for better absorption into the skin. As such, it delivers superior moisturisation without clogging pores. Naturally rich in Vitamin A plus essential fatty acids, it can also help to repair and regenerate skin cells. Tocopherol (Vitamin E) enhances antioxidant protection and then there’s the ever present primary humectant, Glycerin. Vegetable glycerin is an organic compound derived from plant seeds which helps to maintain water balance, promote cell growth and improve the overall appearance of skin. Lastly there are a couple of preservatives rounding off the formulation. 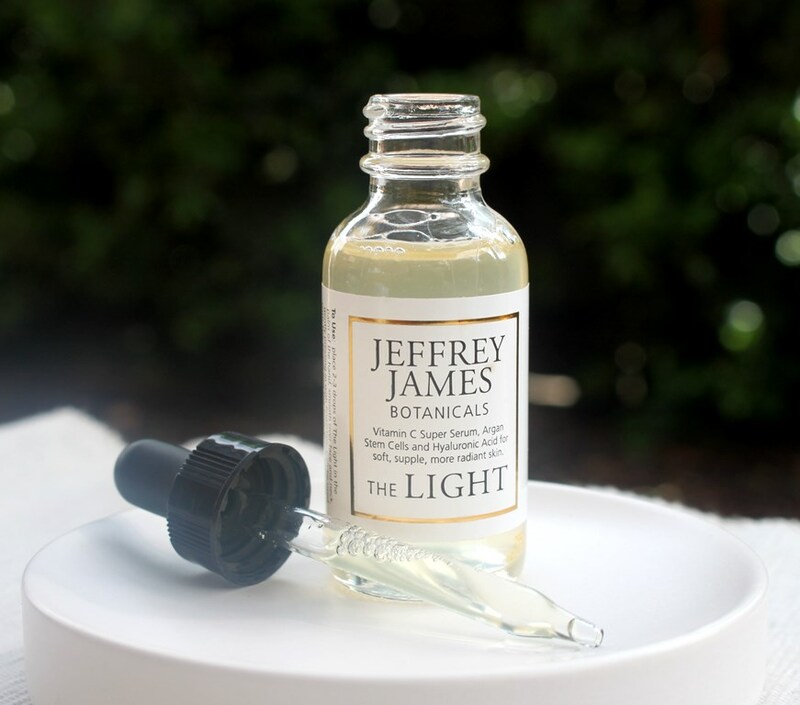 The Jeffrey James Botanicals The Light serum is presented in a glass bottle with screw top dropper lid. The bottle is plastic film sealed to prevent accidental opening and also ensure it hasn’t been subject to tampering. 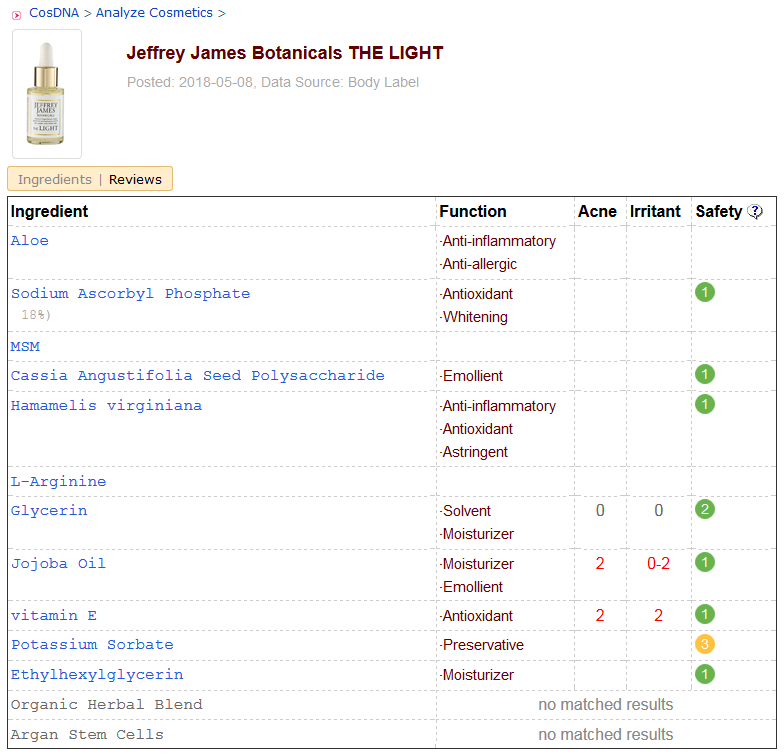 Both the CosDNA and EWG assessments deem the Jeffrey James Botanicals The Light clean. Place 2-3 drops of The Light in the palm of the hand, smooth over face and neck, gently pressing in with fingertips. Use morning and night. Jeffrey James Botanicals describes the smell of this serum as what you might expect when “laying in a field of wildflowers with nothing but a lemongrass sun kissing you right on the face”. It’s very poetic and even romantic but what really counts is that there are no additives for fragrance enhancement. 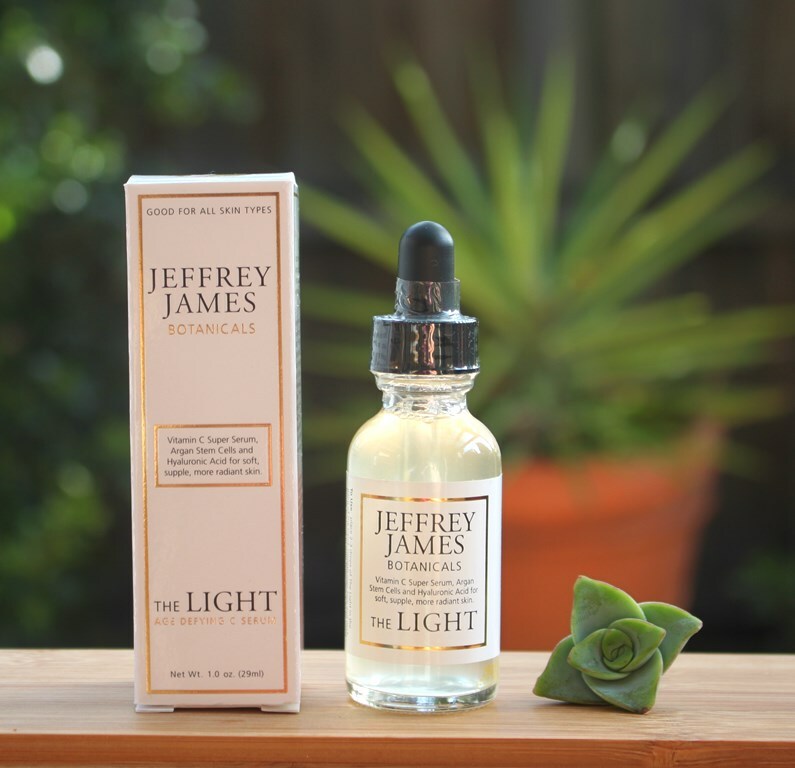 A 30ml bottle of Jeffrey James Botanicals The Light serum has a recommended retail price of US$49.00. It sells for a little less at iHerb. 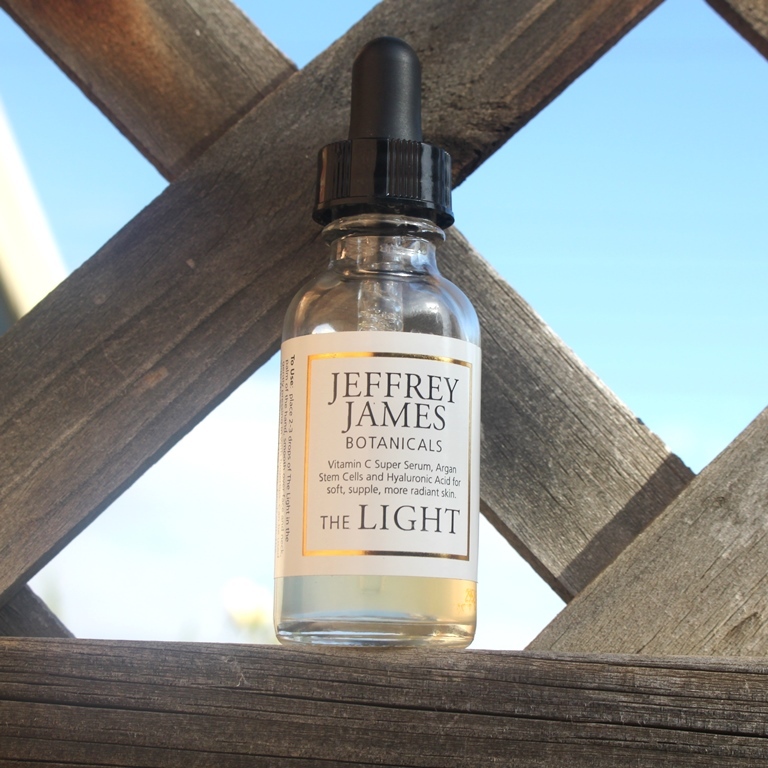 The Jeffrey James Botanicals The Light serum expires 12 months after opening. Having traveled an unorthodox path to skincare, Jeffrey James, previously a footballer, was inspired by his own father’s battle with skin cancer to produce a 100% botanical skincare line free of chemicals. 90% of men and women out there, are using these department store brands. They’re putting nothing but pure chemicals on their skin and it’s absorbing into their nervous system, their breasts…it’s absorbing everywhere… Why are we putting chemicals on our body? People just are really unaware. I was determined to give people an education to give them a better option. This is my first product from the range. The labeling and naming is consistent, each presented in a minimalist fashion and labeled by a noun that represents the product’s purpose. In this case, the vitamin C serum which is supposed to leave you with a radiant complexion is entitled The Light. It is packaged in a clear bottle with screw top dropper dispenser. The clear glass implies the serum is not subject to light degradation, unlike the L-ascobic acid vitamin C derivative which is highly volatile and only enjoys a short shelf life. Regardless, I tend to leave my serums in a dark place, my bathroom drawer. The liquid is more viscous than water and also a little cloudy. It has a slight scent which is unoffensive and completely natural, nothing included for fragrance, botanic or synthetic. As an advocate for fragrance free skincare, this is a real plus. I apply around 4-5 drops each time. This is my first active in my morning routine and it follows cleansing and a first treatment essence or lightweight toner. Spreadability is easy and absorption just as good. The serum melts into the skin without a trace. There is no sensation on the skin it simply soaks it up. To put my experience into context, I have been using the Timeless Vitamin C serum every morning for nearly two years. Given the duration, clearly I enjoy it and it has given me excellent results. So, this version from Jeffery James Botanicals is working on previously brightened skin, so a measure of its efficacy would be its ability to maintain that radiance and skin tone, keep pigmentation at bay and potentially even outshine those results. This trial has been active for around 8 weeks and I have used just over half the bottle with intentions to continue and finish it. Thus, a bottle should last around three months depending on how heavy handed you are. I have very much enjoyed the fact that I don’t have to refrigerate this serum in order for it to retain its potency. The texture is light, the absorption is fast without residue and the scent is mild and naturally derived without added fragrance. So big ticks for convenience and application. The results… well, I think this serum held its own against the Timeless version. My skin continues to be bright and my tone relatively even apart from a few slightly darker patches, the outcome of sun damage due to poor sunscreen use in my youth. In fairness, none of the Vitamin C products I have tried have had much impact on this. As for anti-ageing, the strong antioxidant protection it provides together with the regenerative properties of Argan Stem Cells, the soothing impact of Aloe Vera and the hydrating effects of Cassia Angustifolia Seed Polysaccharide (nature’s HA) would go a long way towards slowing down the process. They won’t turn back time, but do give skin a fresher and thus more youthful appearance. Since The Light contains a stable form of Vitamin C, the formula doesn’t need to include supporting, stabilizing ingredients like Ferulic Acid. Instead it focuses on adding hydrating effects with inclusions like HA and aloe vera. These are present at notable concentrations so contribute favourably to the formula. 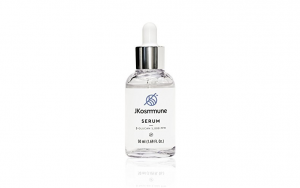 As such, it can be said that this is not just a Vitamin C serum, but rather a multi-purpose product that successfully delivers tone brightening and evening, anti-ageing protection and hydration. I purchased a few items from the Jeffrey James Botanicals line because on paper, they sounded wonderful. I am pleased to confirm that with this particular product, this is also the case in practice too. Using The Light has been an enjoyable experience. I have already purchased a back up! Although L-ascorbic acid may offer more potency, it also deteriorates quickly. 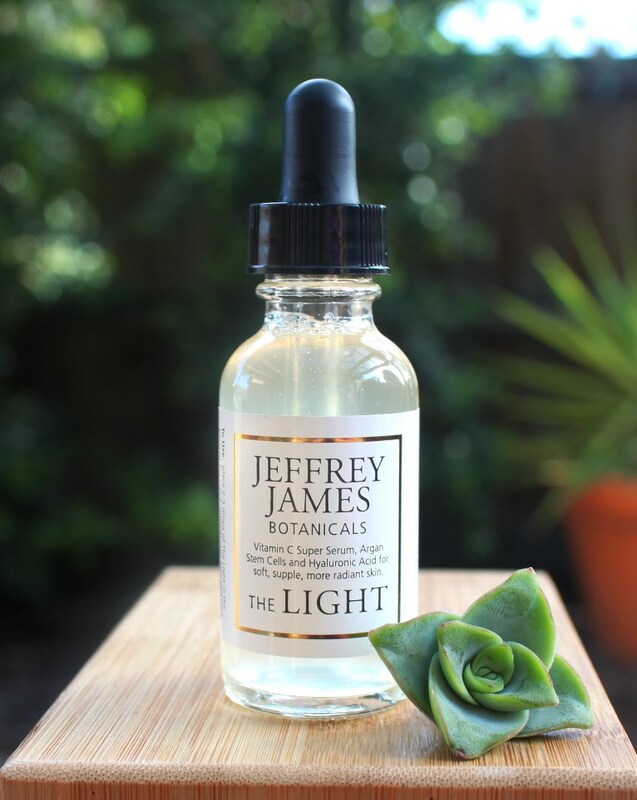 This stable derivative is an effective alternative and in the Jeffrey James Botanicals The Light serum, incorporates hydrators to also plump the skin. I’m very much looking forward to trying some of the other items from the brand.